This morning, 11 years and one day after 9/11, the European Court of Human Rights has delivered its judgment in Nada v Switzerland. The case concerned targeted sanctions by the UN Security Council, which had (until they were revised) prevented the applicant from leaving the small Italian town of Campione d’Italia. This was because the Security Council sanctions required states to prevent the applicant from crossing their borders, and Campione d’Italia is an Italian exclave within Swiss territory. Because the applicant thus could not enter Switzerland, he could not travel to any other part of Italy, either. The judgment was eagerly awaited by human rights lawyers, and by those concerned with more general international law, as well. This was largely because the case raised the thorny question of whether the UN sanctions enjoyed precedence over the ECHR under Article 103 of the UN Charter. The Court had avoided this issue in the earlier case of Al-Jedda v United Kingdom, preferring there to read down the UN resolutions and thus remove the conflict by means of a harmonising interpretation. This was convincing, but wasn’t necessarily going to help in Nada, because the obligation not to allow Mr Nada to travel internationally was much more precise than was the alleged duty to detain Mr Al-Jedda. In fact, the Court in Nada has now recognised as much (para 172). – It could nevertheless have ‘read down’ the UN obligations even in Mr Nada’s case. This might have involved a judicial extension of the very limited exceptions allowed in the sanctions regime. But this would have been exceedingly difficult. – It could also have ‘read down’ the ECHR. This it could have done either by denying that the case came within Swiss ‘jurisdiction’ for the purposes of Article, because the matter was determined by the UN. However, the Bosphorus case, another case on the application of UN sanctions by a state, would probably have precluded this. Or the Court could have found Articles 5 and 8 inapplicable on the facts of the case (for the purposes of Article 13, this would have required even denying an ‘arguable case’ under Article 8, which was problematic). – If the conflict thus could have been avoided from neither the one side nor the other, the Court could have gone along with the Government and the Swiss Federal Court in holding that UN law took precedence over the ECHR. This was unlikely as a matter of judicial policy. – Instead, the Court could have been minded to follow the ECJ case of Kadi and Al Barakaat International Foundation v Council and Commission. There, the ECJ had declined to give precedence to UN law over the law of the EC/EU (which the Court of First Instance before it had done). The ECJ recast the relationship between EC/EU law and international law on a strict dualist model, thus subordinating the UN Charter to the law of the European Treaties, including fundamental rights law. The ECtHR was unlikely to do this, because the European Convention can by no stretch of the imagination be assimilated to a domestic system, separated from other international law by a dualists’ wall. In the event, the European Court did not take any of these positions (except, in part, the first). It is noteworthy, however, that Judge Malinverni (still sitting for Switzerland in this case, but no longer on the Court) advocated a Solange I solution in his Concurring Opinion. The Court found that Switzerland had enjoyed a limited degree of discretion under the sanctions regime. For the reasons given in the Joint Concurring Opinion of Judges Bratza, Nicolaou and Yudkivska, this conclusion is not free from doubt. However, also as stated by those three judges, the judgment was not actually based on this purported discretion. Fundamentally, the Court considered that Switzerland had violated the applicant’s rights under Article 8 (respect for private and family life and for the home) by failing to take measures in the applicant’s favour within the constraints of the santions regime – or ancillary to the sanctions regime. Thus, Switzerland ought to have alerted Italy (as the applicant’s state of nationality) and, via Italy, the Security Council’s Santions Committee, to the fact that there was no reasonable suspicion against the applicant. Switzerland was also required ‘to adapt the sanctions regime to the applicant’s individual situation’ (para 196 of Nada) and to mitigate the effects of the sanctions on the applicant. This it had not done to any sufficient extent. Having found a violation on this approach, the Court left undecided whether Switzerland was also obliged flatly to disobey the Security Council. It specifically left open whether the UN Charter did or did not trump the Convention. This general question under Article 103 of the Charter remains unanswered. The Court avoided the issue by concentrating on violations committed just outside the sanctions regime. 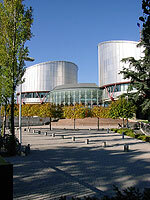 Regarding the right to an effective remedy (Article 13 ECHR), the problem was that the Swiss Federal Court had declined to strike down any of the UN sanctions as contrary to Swiss human rights law. In this regard, the Court followed Kadi in holding that UN law did not prevent judicial review of the domestic implementation of sanctions. In effect, it appears that the European Court has not taken a Kadi approach itself, but has mandated domestic courts to take it in domestic law. If so, this is quite interesting. The Court appears to have overcome its own international limitations by putting itself in the shoes of a domestic judge, through a review of that judge’s jurisdiction under Article 13. This entry was posted in on Human Rights Law, on International Law by Tobias Thienel. Bookmark the permalink. Pingback: European Court Decides Nada v. Switzerland « EJIL: Talk!